Periodontal disease commonly known as “gum disease” is prevalent in a majority of people. Gum disease causes inflammation and infection of the gums and in turn destroys the supporting foundation of the teeth. Although it may start virtually pain-free, it is one of the top reasons for tooth loss in adults. Also, gum disease is implicated in a wide variety of diseases such as heart disease, diabetes, dementia, and a wide variety of inflammatory disorders. Symptoms of more advanced disease may include red, swollen, receding, or bleeding gums. Other symptoms include bad breath and teeth becoming loose. Periodontal (gum) checkup is recommended during bi-annual dental examinations in the office. 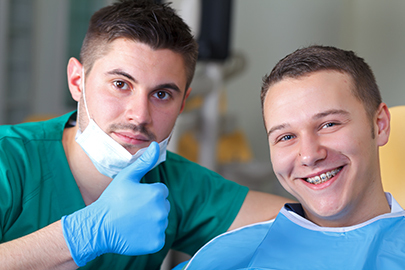 The treatment for gum disease can vary depending on the severity and unique health history of each case. Treatment options available at Sparkle Dental include – non-surgical scaling and root-planing, surgical periodontal therapy, Perio Protect and Laser gum surgery.